Options abound with our darling Georgetown Leg Table! 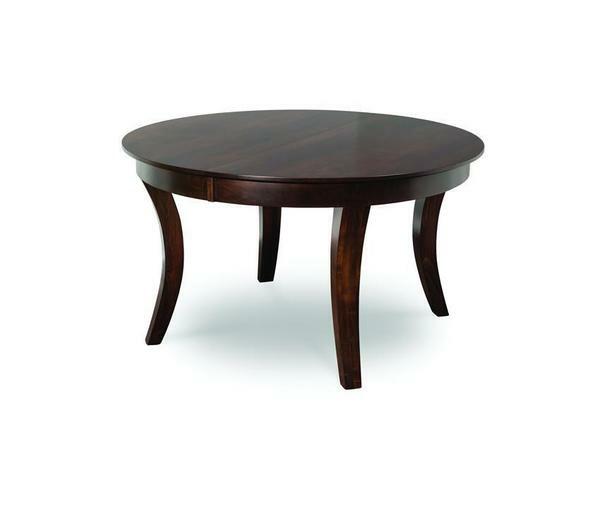 Elegance covers ever inch of this piece, from a smooth top to robust, curved legs that not only promise sure construction but add charm to your dining room. This table is made in a Northern Indiana Amish wood shop -- contemporary in appearance, this piece boasts old-world craft standards. For the perfect pair, see our Amish Georgetown Arm Chair, shown in the image above. These chairs mark any space with sophistication and unique design. We love their combination of traditional and contemporary elements: from a no-nonsense traditional back and upholstered seat to chair arms unlike any others. Chair back legs are reflected in this table's own, effortlessly blending the two pieces. 3 round sizes available: 48", 54", and 60"
If you have any questions, please do not hesitate to contact us! We look forward to starting your custom order today. Shown in Brown Maple with Asbury FC 7992.